I hear a kettle boil and click. I see the steam rise soft and thick. I sense that kettle’s very hot. Will I touch it? NO I’ll not. I see green mould upon the fruit. I touch it and it feels too soft. I smell the scent of yucky rot. Will I taste it? NO I’ll not. I feel the raindrops on my skin. I smell the dampness closing in. I see the lightning on the hill. Will I hear it? Yes I will. I see the smoke and bonfire blaze. I feel its warmth upon my face. I hear the crackling spits and spills. Will I smell it? Yes I will. I hear a mossie’s whining flight. It stops. And then I feel a bite. Will I see it? Not at night. Will I squash it? Yes I might! Celia said: If asked to do something, people may say YES and then change their mind. I tend to say NO first-up, THEN change my mind! Which way round will it be for you? Words and pictures dance a joyful duet throughout the pages of this beautifully presented illustrated collection of poems. Magic Fish Dreaming invites young readers to seek out and appreciate the wonders of this world we share and recognise the poetry in the natural and urban environment. June Perkins’ poetry is evocative and whimsical and their spirit is reflected in Helene Magisson’s exquisite full colour illustrations. The collection opens with the delightful Hunting for a Poem, my personal favourite. Readers are then led on a journey of the imagination to explore secret places, chat with a cassowary, do a storm dance, sing a rain song and let their imaginations roam free in rainforest country. Perkins has been writing, performing and publishing poetry in Australia and the Pacific. She won an Australia Day cultural award in 2011 for services to writing and mentoring youth. June has published two books, Under One Sky (2010) and After Yasi, Finding the Smile Within (2013). In 2008, after moving to Far North Queensland, she coordinated Ripple, a community project for multicultural groups and schools to celebrate poetry and photography and began writing some of the poetry that would become this book. In 2016 she won an Australian Society of Authors mentorship and has been working on picture books and a young adult novel ever since. Magisson was trained in the art of medieval illumination in Paris, exhibiting her work in Europe and teaching the history and techniques of medieval miniature in primary and high schools, both in France and in India, where she lived for a few years. When she settled in Australia, Magisson decided to start a new career in children’s book illustration. She has illustrated, The Velveteen Rabbit by Margery Williams Bianco and Night Before Christmas for New Frontier. Several other projects are due for release in 2017. The book was created through crowd funding from 142 backers from 10 countries. Magic Fish Dreaming is a book to share and to treasure in families and in classrooms. It is currently available through Peter Pal library supplier, direct from author at https://magicfishdreaming.com/ and from selected Queensland book stores. As the title suggests, this collection written and illustrated by Mike Lucas is a mix of silly and sensible poems, with most falling into the former category. Poems range from the ultra-short to the super long and are sorted into sections such as growing up, animals, space and time, fairy tales and people. Most are accompanied by Lucas’s line drawings. All are child friendly and Lucas clearly has the capacity to slip easily into the world of childhood. The silliness will appeal to young readers, as will the farts poems and frequent use of invented words. There’s a lovely sense of rhyme and rhythm in some of the poems, while others I found a little awkward to read aloud, which for me is always part of enjoying poetry. It’s all about me, The not upside down poem, The exactly one minute poem and Don’t steal the scare from a grizzly bear are my favourites of the 99 poems featured in the collection. Big Silly and Little Sensible makes playing with words and writing poetry seem like a lot of fun, so would be a useful addition to classroom resources. The book includes some blank pages where young poets are invited to write their own poems. Big Silly and Little Sensible is available here. From the title with its play on the line from our national anthem to the content and the creators, this anthology is Australian in flavour and is sure to become a popular addition to home and school libraries. Dianne Bates, who selected the poems for inclusion, said her aim in compiling the anthology was to honour some fine Australian children’s poets and there are many names that will be familiar to poetry lovers. The book is well presented and easy to read and features a diverse range of child-friendly, well-crafted poems sorted into categories of Mostly Me, Families, People, Animals, Sport, School and Special Times. “In choosing which poems to include I was guided by numerous factors,” Bates said. “First I needed to believe that any given poem would appeal to child readers; I asked myself would they understand the poem and would they like it. “For me, a poem needs to touch the readers in some way, not just intellectually but emotionally. The reader ought to have an ‘ah’ moment. Our Home is Dirt by Sea fulfils Bates’ intent. It’s difficult to highlight individual poems from an anthology of this quality. Among my personal favourites are If I Were a Kid (Jane Williams), Quite Bizarre (Kylie Seeberg), The Lady (Ann Coleridge), A Dancing Cat (Janeen Brian) and Christmas Visitor (Bill Condon). Some poems will amuse and entertain, while others will prompt serious thought, such as Auschwitz Flower by Ian McBryde and The Last of His Tribe by Henry Kendall. The anthology is a wonderful resource for schools. I’ve used it in my creative writing sessions for young people and adults and find it offers excellent examples of diversity in style and voice. The only aspect of the book that jarred with me was the background graphic of the Foreword, About the Poets and First Lines Index. It works on the colour cover but interferes with text clarity in mono in the interior of the book. Bates said the anthology took a decade from research to publication. It’s been worth the wait. Anyone who enjoys poetry – child or adult – is sure to find many poems to love and share in its pages. Our Home is Dirt by Sea is available from the publisher here. For typical Aussie teenagers, Jonah and Manx, life mainly encompasses fishing (for mullet) at the local Coraki lake, watching — and joining — school mates party on Friday nights and looking for courage to further develop their relationships with Ella and Rachel. There are other problems, of course, insofar as Jonah’s warring parents are ending their marriage, motherless Manx has issues, too, and the boys’ lakeside town is about to be sold off to city outsiders for redevelopment. This creates tension in town, especially when someone scrawls graffiti against the Sydney interlopers on the local real estate office owned by newcomers, the Lloyd-Davies. and two for the door. and four for the floor. and six for the night. and eight for the light. and ten for my bed. to hold in my head. Katherine says: Going to bed isn’t always a happy time but it can be made fun with ‘ a one-step-at-a-time’ count-up. Your Poetry Prompt #23 reminded me of this situation. 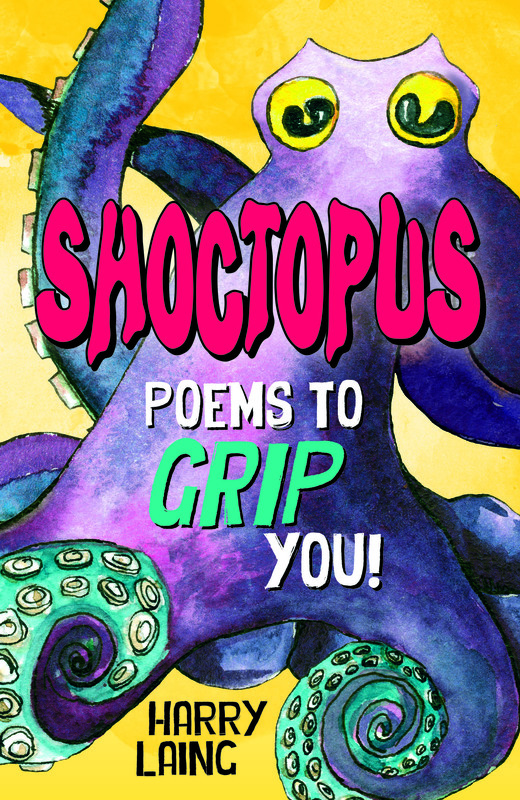 The cover of Shoctopus is bright and appealing and as one flicks through the 95-page book, it’s apparent that much thought has gone into making the book as child-friendly as possible. It’s attractively designed with frequent black and white illustrations. It’s also apparent that the collection has many different topics and poetic styles; dipping into it is a pleasure. Laing has obviously played with words in all of his child-accessible poems. He tells poems from the point of view of a ‘Supertap’, a leech, a worm, and even a wheelie bin. There are raps such as ‘Billy Rap’, limericks, shape poems, a poem that looks like the forest it is about, even life stories (such as ‘Potato Story’), a prose poem and more. Quite a few of the poems are about animals – skink, Pobblebonk frog, a blowie (called Chloe) and an emu; and there are poems from the point of view of objects such as toothbrushes, tyres and trees. A few poems reflect children’s lives; one such poem is ‘It Doesn’t Make Sense’ about a kid falling out of bed. My only quibble about the collections is that it would have been good to have read more child-narrated poems like this one. The main message of Laing’s collection is that the poems in this collection are great for reciting aloud, and they ought to be read. There’s no doubt that they will be popular with most readers, even adult ones.